Hi, there. No episódio de hoje do podcast Inglês Online, eu falo sobre aquela situação em que você ouve a conversa de outras pessoas sem querer. E também a situação em que você ouve de propósito! Hi, there. This is the new episode of the Inglesonline podcast. Thanks for all the comments at the iTunes store and if you haven’t yet left a comment for this podcast please do so: the more comments for the Inglesonline podcast, the more people will find out about it and listen to the episodes. So today we talk about eavesdropping. Yep, eavesdropping on someone else’s conversation. Have you heard that term before? Here’s a popular definition for the word: eavesdropping means secretly listening to the private conversation of others without their consent. Basically, every time you pay attention to and try to listen to what other people are saying (and you’re not part of the conversation) you’re eavesdropping. Well, of course, sometimes you can’t avoid it. I mean, how many times have you been in an elevator and then someone stepped in while chatting on their cell phone and they happily carried on the conversation as though they were alone? You can’t help but overhear what they’re saying in that case, and that is the second term of today’s episode: overhear. So the difference between eavesdropping on a conversation and overhearing a conversation is, one is on purpose and you’re kinda not supposed to do it, while the other one happens unintentionally. Like I said though, if you’re surrounded by people who are loud talkers, you would pretty much have to cover your ears to avoid overhearing, no? And you quietly put your ear to the door – well, then you are clearly eavesdropping. No two ways about it: you are eavesdropping. 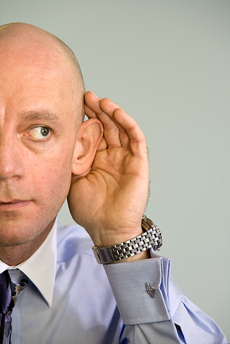 OK, now I’m going to ask you to admit to it and let us know about the last time you eavesdropped on a conversation. Who were you eavesdropping on, and did they ever realise you were there? What was the conversation about? C’mon… tell us! Here’s what someone tweeted out: I’m glad our ears don’t perk up like dogs when we’re eavesdropping on a conversation. So, yeah! You know how a dog’s ears will perk up when they’re paying attention to something. If that happened to us human beings, well… I bet we would start thinking twice before eavesdropping. Now, overhearing what other people say is so common. When we’re standing in line at the supermarket or just walking down the street, we can’t help but overhear all kinds of things. I mean, there are entire websites devoted to strange or funny things people overhear while out and about. I’ve overheard many funny things in my life, and I have also gotten a few looks from strangers who’ve overheard me talking to other people. I wanna hear your stories: tell me about something funny you overheard someone say. Let me know in the comments, and talk to you next time! Whoa – you’re eavesdropping for sure!! Hi Ana! Sincerly I never heard the term eavesdropping before.Very interesting! That’s the thing about learning English: we never know enough. Thanks for each new lesson you teach us! So, I’ve started listening your podcast and became surprised again . You announcied that would talk about “eavesdropping” and HAVE TAUGHT much more… No two ways about your efficiency. Great to know you’ve enjoyed it! So, I’ve started listening your podcast and became surprised again . You announcied that would talk about “eavesdropping” and teached much more… No two ways about your efficiency.